In the past I have discussed the psychological phenomenon known as "home bias," which in simple terms means investors are more likely to purchase stocks from their own country. See How The Home Bias Phenomenon Impacts Investors. "The tendency for investors to invest in a large amount of domestic equities, despite the purported benefits of diversifying into foreign equities. This bias is believed to have arisen as a result of the extra difficulties associated with investing in foreign equities, such as legal restrictions and additional transaction costs." I am reading a book this week called "Misbehavior: The Making Of Behavioral Economics," which is the best book I have ready this year by far. It reviews the journey of the author, Richard Thaler, from the early days of his behavioral economic research through present day. Throughout the book he provides steady examples of the irrational behavior humans engage in due to the way we are made up psychologically. The home bias phenomenon is a perfect example of this irrationality. As a United States citizen I see it every day. 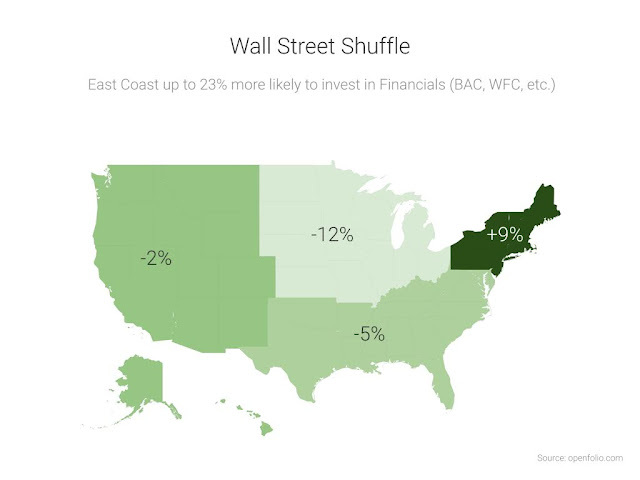 The majority of finance articles published by U.S. media outlets are about U.S. stocks. Why would that be in today's borderless financial world? Numerous studies have shown investors in the United States have an irrationally large percentage of their portfolio composed of U.S. stocks. This comes at a time when U.S. companies in general are far more expensive than foreign markets, due in large part to the explosive move higher in price over the past 4 years. Over this period the rational investor would allocate a larger percentage of his or her portfolio to less expensive global stocks as prices in the U.S. move higher, but usually the exact opposite occurs. Barry Ritholtz put some charts up on his site today showing how home bias even exists within the borders of countries. 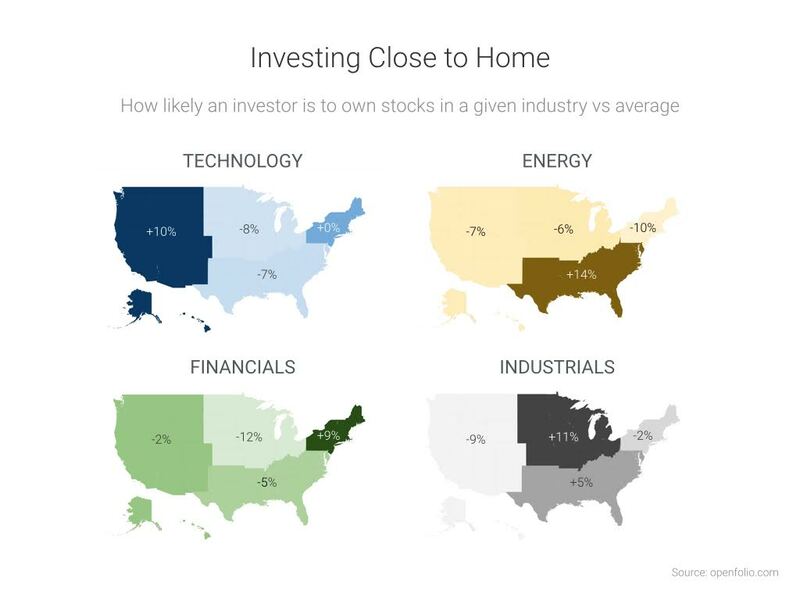 The visual below shows investors favor technology out west, energy in the south, financials in the northeast and industrials in the midwest. Why? Investors are surrounded by these companies so they are familiar with the names. This makes them more likely to purchase these stocks over a company they are less familiar with (even though another company or sector may be far less expensive or have greater earnings growth potential in the future). Digging even deeper you often see employees have an over sized weighting of shares of companies they work for in their portfolio. This again shows home bias and investor irrationality at work.